Technique- Out of The Box, or “Oval,” and Whisper Frames. We were out to North Dakota a few weeks ago on vacation. No stop in Wahpeton would be complete without stopping to see my (Partner in Crime)… Sandy. We started Scrapbooking in 1994 and in 1995 we completed our books, then I talk her into Stamping!!! Needless to say after a night of talking, showing and playing with cards, we had a great time. Sandy said if you run up to Fargo before you head home,…. You (HAVE TO) stop at K&K Crafts in the Moorhead Center Mall. Let me tell you I was never so happy to spend two hundred dollars in such a shot time as I felt that afternoon. This card is just a small part of my goodie I came home with. Stamp credits are Impression Obsession, the verse is from “Good for the Soul”, set CL-321 and “Gardening Tools”, F-1805. New Spellbinders dies are, “Floral Flourishes”, set of seven dies. The image was colored with Copic markers and sprayed with (my mix of), Glimmer Mist. I stamped the verse on acetate. My background paper is from Basic Grey called “Curio”. Thanks so much for your time this afternoon, have a wonderful rest of the week-end. Stampin’ Hugs Vada. Gorgeous card Vada - love the layering of images and embellishments! 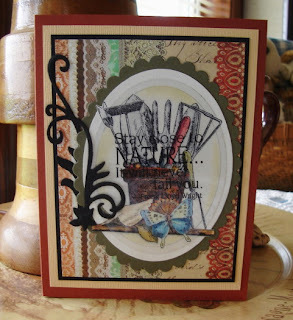 Great card, Have fun playing with all your new finds! Glad your back and hope you had a wonderful time. Thanks Vada for entering my giveaway and best of luck! Sounds like you had a great time! This is a wonderful card, love the layering and colouring. Vada, beautiful layers and colors! Love the nature theme! So glad you had a lovely visit and even managed to come home with some gold! Amazing how we can go through $$$, so quickly! Enjoy your new toys! Sounds like a crafty trip! Love your card. GC-109 Chestnut Theme is “On the Road”.